So far in this brief series on in-band signaling, we looked at two of the common methods of providing control signals along with the main content of a transmission: DTMF for Touch-Tone dialing, and coded-squelch systems for two-way radio. For this installment, we’ll look at something that far fewer people have ever used, but almost everyone has heard: Quindar tones. [Barry] shared his postulation on how electronic key impressioning works (google cache). You may remember his foil impressioning demo from earlier in the month, but now he’s addressing a piece of news we must have missed. Apparently, a handheld impressioning device is about to hit the market that can tell you the key codes for a lock in a matter of seconds. [Barry’s] guessing at how this is done from his experience with a similar device aimed at car locks. 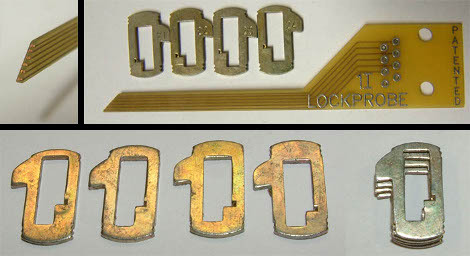 When the circuit board seen above is inserted into a lock, it completes a circuit between the lock housing and the wafer. The firmware monitors the conductors on the tip of the PCB to calculate how deeply the cut should be and at what point on the key. This would be fun to try with a homemade PCB, any idea how to deal with wrapping traces around the edge of the board like that?